Do your kids ever get bored with doing school at home everyday? Looking to add in a little variety and fun? Look no further than your local library! Today I packed up bags for each of my kiddos and we headed out to our local library for a day of school! Each student grabbed a good sized bag (for example our All About Reading bag), and we emptied out their workboxes…sans really big stuff of course! 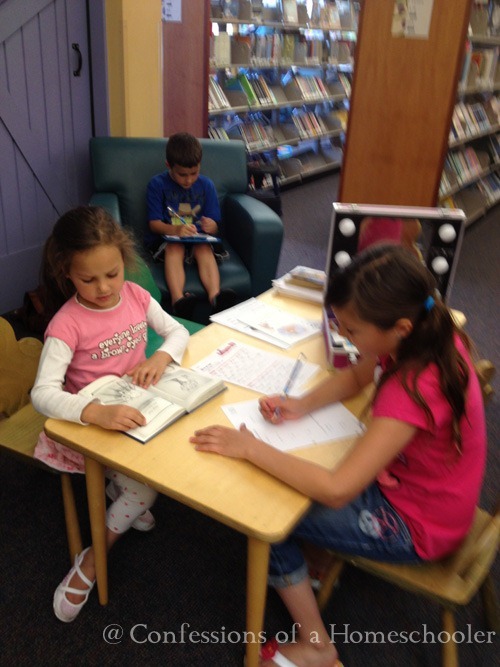 We went into the children’s section of our library and found a comfy desk area to work. (Sorry for the blurry pics, I was taking them with my iPhone so as not to attract too much attention LOL!) 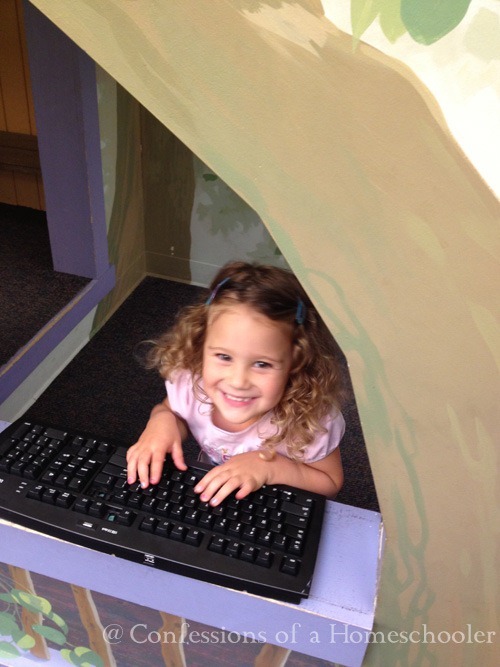 The good thing about the children’s area is that there are kids in there, so you don’t have to worry about being totally quiet when working. If you have older kiddos, I’d suggest the regular area since the children’s area can get a little noisy at times. The lighted suitcase is Strawberry Shortcakes! It was a Christmas present, turned into a school work briefcase, perfect for today! 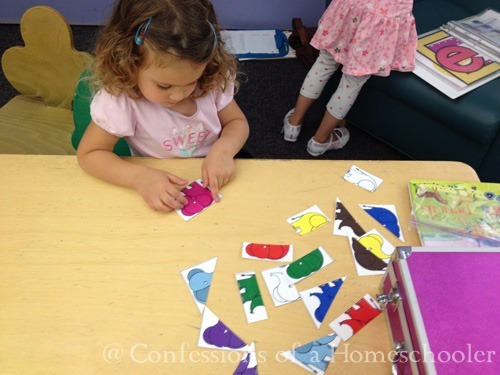 Even the Teeny Tot brought her Letter of the Week stuff with her! 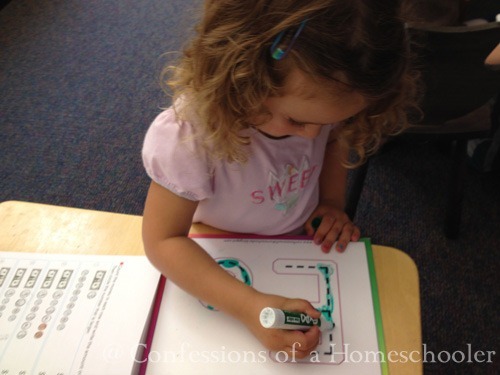 We just brought our Letter E binder and I let her pull out whatever she wanted to do for the day. After we were done, she got to play in a little playhouse we were sitting. 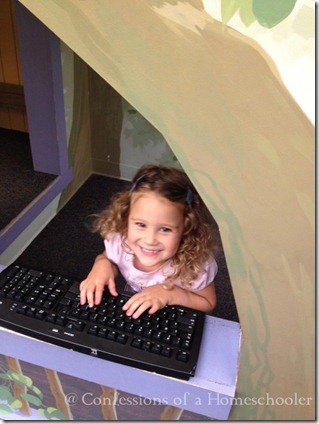 It had an old keyboard and mouse inside, and that thing entertained her forever! Later she found a few fun picture books to look through while the older kiddos were finishing their work. Once we were all done, we all picked some books to checkout! I’d call that a successful homeschooling day. 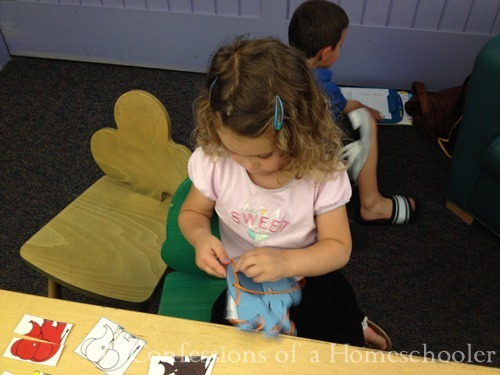 Homeschooling doesn’t always have to mean that kids are chained to desks all day long! Use your imagination and make it fun! 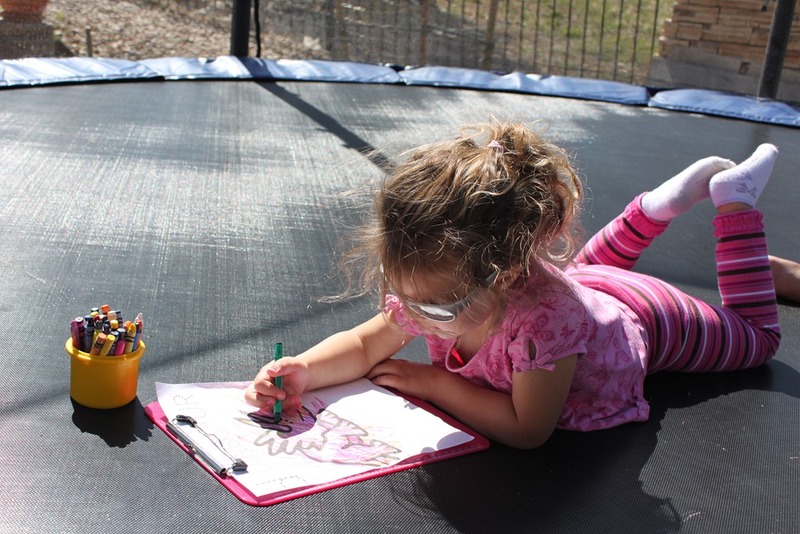 We even do school on the trampoline every now and then! Have some fun ideas on making homeschooling fun? 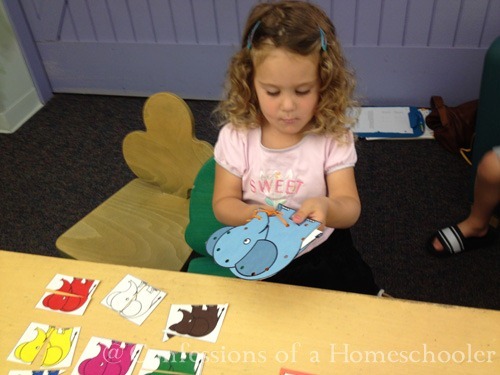 Leave a comment below sharing how you keep it interesting and provide a little variety to your homeschooling day! What a GREAT idea!! I will be trying this very soon!! Thanks, Erica!! The other day I turned our school day into a baseball game. My boys were so excited and they still ask to play “baseball school” every day. It’s helped our days go so much smoother. I love it when that happens! Great idea! TOO FUN! This is our kind of homeschool. We are using a combination of the backpack system and the workboxe system. We love that we can grab and go. 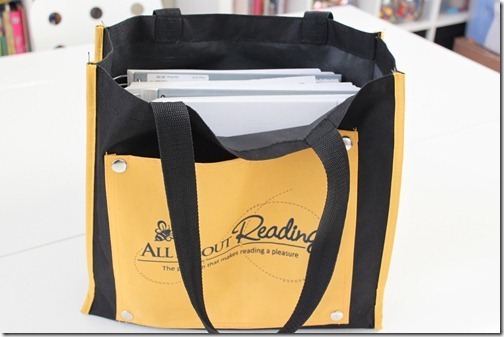 I even had an idea for like unit studies or as some call theme theme units to have a bag for each letter of the alphabet for example so we can just grab and go. We’ve library schooled many a day. It works to keep the work environment fresh. When renovating (which seemed very often in our current home) I’d pack up the kids and go. The winter can also cause cabin fever, so off to the library we’d go. A suggestion, we’ve also signed up for time using study/meeting rooms in our library because on occasion when baby/toddler programs were happening it caused distractions for us, so a separate room worked wonderful. And my youngest wasn’t so able to run free when I needed to sit with another. We just did a day at the library to mix it up a little. I want to try a coffee shop as my ten year old daughter loves time in the shop because I often take “adult-time” with friends without her company at such places. We also have a porch swing that lays down into a flat “hammock” and we did school and a picnic lunch on the front porch. Started out cozy with blankets in the morning and took them off as it heated up and was the perfect weather! We have only be homeschooling for a few weeks but already my 7 year old pulls all of her school work, her little chairs, supplies and makes a fort in the corner of the living room to do her work for the day. What do I care? She gets her work done and count that as creative work. My kids love going outdoors and library too. You are surrounded in cuteness! 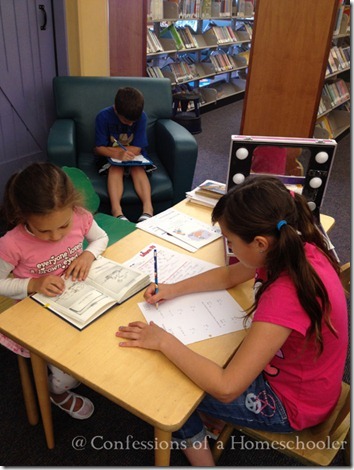 Even your library is cute just like your classroom!